At this point it’s pretty clear that pesticides are endocrine disruptors. They don’t belong in our fertility boosting foods or any other foods for that matter. I could cite a list of studies to validate that statement, such as the Danish research in the 1990’s which showed that sperm counts were declining at such a high rate, there would be little sperm left in 50 years. Or a follow up study that showed young, college aged men with sperm counts that should call for an urgent visit to a fertility specialist. Or a study on the way toxic chemicals interfere with transport, metabolism and elimination of hormones in our bodies. But rather than a list of studies, I thought it would be a lot more fun to share a list of our favorite eateries that serve clean, pesticide free food. With all the evidence of the health and fertility damaging effects of pesticide-laden food the number of restaurants serving reliably clean food is still pitifully small. Sadly even juice bars and restaurants promoting their “healthy,natural menu ” are using ingredients that are not nearly as healthy as we are led to believe. If you have a favorite spot in your town or neighborhood why not give them a shout out and I bet many of the proprietors might even let you share a recipe. And we could have an end of summer Fertile Heart Viirtual Pot Luck! We are immensely blessed here in Woodstock and the environs to be graced with a number of reliably clean-food eateries and I hope to share recipes from several of them. 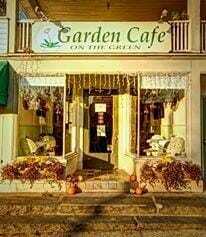 In preparation for this post I approached Pam Brown the owner chef of the fabulous Garden Café on the Green here in Woodstock and she graciously handed me a booklet with a long list of mouthwatering recipes. I chose Pam’s Tempeh Salad with Walnut Dressing since just about every single ingredients in it (except one, see my note in the recipe) is a perfect fertility food. 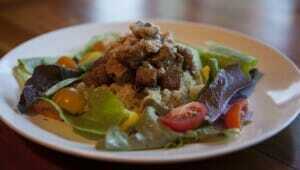 Let me know what you think about the Tempeh Salad and I can’t wait for my virtual visit to your kitchen and a taste of your special flavorfully fertile stork tempting dish. And would you post a picture of your creation? 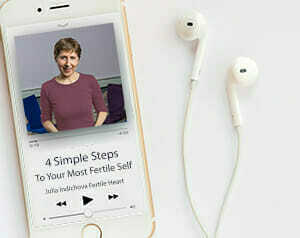 For those of you who will be joining or re-joining one of our fertility support teleconferences in September this can also be a fun way for us to get to know each other and to keep in touch in the next few weeks. So let’s get out our spatulas, hum a tune that makes our bodies move, ovaries come alive and mouths water! This wonderful Pam Brown recipe is chockfull of fertility friendly ingredients. Tempeh, a fermented soy product is a great source of protein, it helps boost estrogen and as such is perfect for anyone with high FSH issues or any other estrogen deficiency related challenge. Walnuts of course are great sources of Omega 3 essential fatty acids , which are one of the key fertility boosting and hormone balancing nutrients for both women and men. Garlic is a terrific antifungal food, olive oil adds healthy fat, another important fertility food to this delicious dish. And it’s gluten free for those of you who are letting go of gluten. So eat up and know that you’re moving closer to the baby with each bite. Ingredients for the Tempeh marinade – 2 eight ounce packages of Tempeh – ¼ cup of Tamari soy sauce (gluten free) – ¼ cup of Olive Oil – 2 tsp Agave, Honey, or Sweetener of your choice Ingredients for the walnut dressing: – ½ cup of Walnuts – 2 cloves Garlic – ½ cup Olive Oil – Juice of one Lemon – Salt and Pepper to taste Pam’s dressing recipe calls for 2 cups of basil leaves but basil leaves in herbal literature are linked to fertility difficulties so I made the walnut dressing without it ad it was delicious. You could also experiment with adding a cup of cilantro to the dressing. Ingredients for the salad: – 1 small red onion, sliced thin – 1 cup cherry tomatoes, halved – 2 cups of chopped lettuce Preparing the Tempeh: Preheat oven to 350 °F. In a medium bowl whisk the above ingredients together. Add the tempeh cubes and toss well to coat. 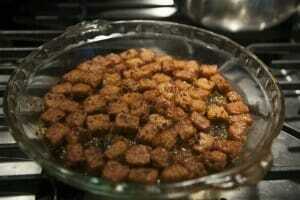 Spray or simply lightly coat a small baking pan or dish with the oil and spread the tempeh in an even layer. Roast about 20 minutes or until the tempeh is brown and crispy, stirring frequently. Preparing the Walnut Dressing In a food processor or Vitamix pulse the walnuts until coarsely ground. Add the garlic and olive oil and pulse again. Scrape down the sides of the food processor and add the lemon juice, slat and pepper. Pulse again to mix. Mix the red onion, cherry tomartoes and tempeh together. Top off with the walnut dressing and stir well. I served it over quinoa. Pam also suggests stuffing it into a pita pocket, or simply eating it as a salad by itself. This is a recipe that I have found is quick and easy to make and very healthy. It avoids dairy and gluten and also abides by the FODMAP principles which help people with IBS (of which I am one). And it doesn’t create too much washing up! 1. put the rice on to cook with usual water but add juice of half/whole lime (depending on your preference). Chop large handful of coriander and put to one side. 2. baste the cod with olive oil and put the cod under the grill to cook. There is no need to turn the cod and it will usually fall apart if you do. Medium grill for about 6-8 minutes. 3. put approx. 2 tablespoons of sesame oil in a wok or large frying pan and slowly heat up. Or if using the garlic flavoured oil substitute 1 tablespoon of sesame oil for the garlic oil. 4. finely chop the ginger and garlic (if using) and add to the oil. Slowly cook for 1-2 minutes. Then turn up the heat so oil is ready to stir fry the veg. 5. Chop the broccoli and French beans and add to the oil. Keep stirring so veggies don’t stick to the pan/burn. Add Tamari to taste (about a tablespoon usually). 6. Add the spinach and pak choi and keep stirring until wilted. Take wok/frying pan off the heat. 7. Check cod and turn off grill if cooked. 8. Check rice and if cooked turn off, strain water and add chopped coriander whilst warm and stir through. 9. Plate up and enjoy. What an awesome place, Erica! thank you for this. Could you post a link to the SAME site?